Posted by Blue on Jan 10, 2014 in Portfolio | Comments Off on Combined Services, Inc.
Home » Portfolio » Combined Services, Inc. 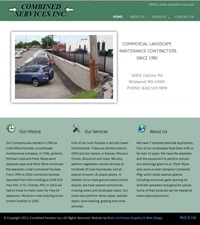 Combined Services Inc. is a commercial landscape maintenance contractor in St. Louis, MO. They requested a simple design from Blue’s ArtHouse to provide an online presence and describe their services.